Now, you are afraid, in desperate need of a friendly face to guide you through this maze of the dead. Then suddenly, through the gloom, you see not one, but two faces, lit by the warm glow of a single lantern. Your worries are over – it’s us, the Guardians of the Hammer Graveyard – Mick Nash and Phil Alexander. We’ve been digging round here for years, clearing away the mould, spiders and dirt from long-buried facts and bringing them out into the open for you to enjoy on this – our cobweb-site!! Be our guest, rummage through our pages and see what we’ve found so far. For instance, you’ll discover how Hammer justified their claim that “One Million Years BC” was their hundredth film, and the truth behind the mad life of Professor Winkel, a new cult figure in the eternal fight against evil, plus a brand-new in-depth filmography of Hammer Films, going right back to 1936. And there will be more – much more. So, add this page to your favourites and keep coming back. 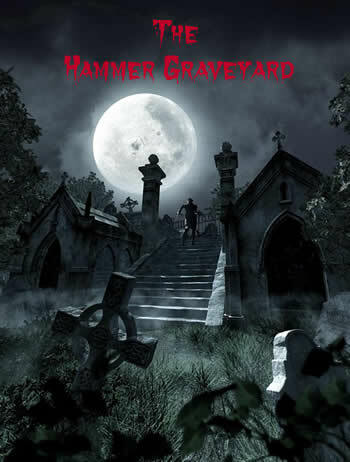 The Hammer Graveyard will constantly be revealing a steady flow of its ghastly secrets!!!! !